Able to control both Windows and Mac machines, Mouse Kit is one of the easiest ways to control your computer from afar from the comfort of your smartphone screen that is always by your side. Why pay for expensive and limited in functionality set-top streaming boxes, when you can just hook up your laptop with a cheapo HDMI cable to the biggest screen in the house, and stream Popcorn movies there to your heart's desire. Well, that's not what the creators of Mouse Kit envisioned, but it's a good start to appreciate the app. 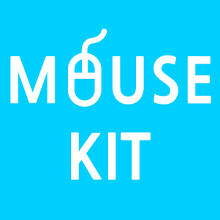 Mouse Kit lets you control your computer as if your phone were a mouse, moving a cursor, around the screen, and having two virtual buttons along the bottom of the screen that you can virtually click, not to mention that no mouse is complete without a scrollbar, and that's what Mouse Kit offers, too. A rarity with such apps, Mouse Kit also includes a keyboard tab to quickly key in search info, or simply tap on the arrow keys to skip parts of a movie. There is a $2.5 in-app purchase that unlocks basic presentation control capabilities, such as back, forward, and F5 buttons, a presentation timer, as well as Shift + F5, End, and Home keys, all you need to be a presentation ninja.